A few years ago a ridiculous joke-game showed up at Origins called “Win, Lose, Banana”. The name of the game, helpfully, also functions as a list of the components: three cards labeled win, lose, and banana. It’s the ultimate distillation of the social deduction genre. One card is handed to each of the three players. Whoever gets the “win” card has to guess who is holding the banana card. Ostensibly it’s an excuse to get people to shout “I’m the banana” in a public space, but I think there’s actually something to learn from the game. There’s not that much difference between Win, Lose, Banana and a social deduction masterpiece like The Resistance. In both games players need to figure out if someone is lying about their “role” in the game or not. The difference is that The Resistance gives you the slightest bit of information through the course of play to aid your guesswork. Missions happen, which can give you concrete, but mostly unhelpful information. Voting happens, which gives you vague, but sometimes helpful information. And as these actions play out, people need to respond to them. Their words and actions in between participating in the strict mechanisms of the games give you more information about whether or not they’re telling the truth. Knowing the strict odds and making decisions between options with equal likelihoods of success is not fun. Having a more vague understanding of the odds, or having good reaction points that let you gain some insight (however minimal) into the psychology of your opponent make for much more interesting and compelling decisions. It’s on this axis that hidden movement games either succeed or fail. It’s a bell curve where if you don’t know anything it’s random guessing, and when you know too much it’s either ultimately random guessing or completely known. Making a hidden movement game work is about extending the times in between when you know some information as much as possible. Hunt for the Ring doesn’t really do that. I’m quite saddened by this because Hunt for the Ring was one of my most anticipated games coming out of PAX Unplugged in November. 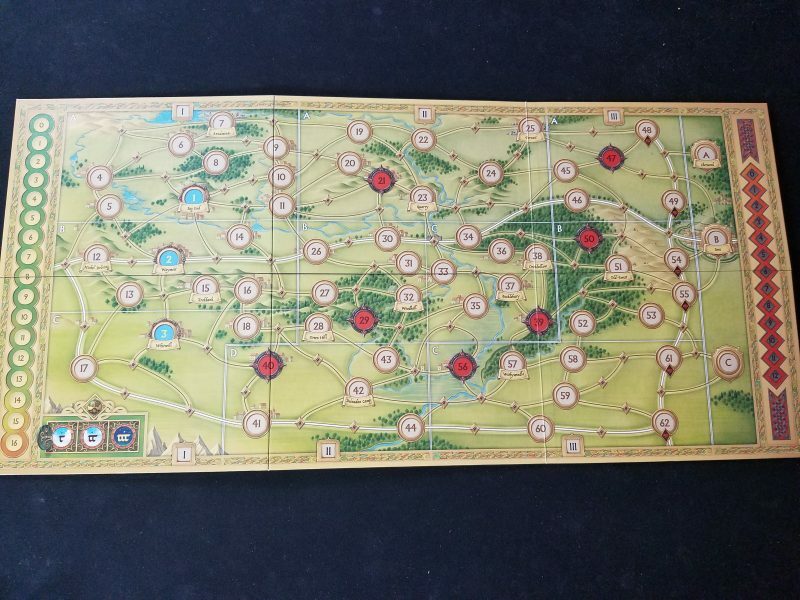 I love War of the Ring, and when I heard that the same designers and publisher were working on a prequel of sorts, I wanted it to be the hidden movement game to rule them all. Indeed, loyal followers of The Thoughtful Gamer will remember that I praised it quite highly on podcast episode 22 after my first play and even said that I recommended it. That was a mistake. I pride myself on not getting bought into hype and making reasoned analysis, but in this case I allowed a fun first play and my own trust in the designers to bypass my knowledge that I should play a game more before I say that I recommend it. My bad! Hunt for the Ring isn’t necessarily a bad game, but the more I play it the more I see its fundamental problems. Primary among them is the fact that the path the ring-bearer player must take is extremely limited. The game track’s Frodo’s journey from The Shire to Rivendell in two parts–first to Bree, and then to the Elven stronghold. In each part the most direct route from start to finish is about 11-12 moves and you get 16 moves to complete the path. It’s less a game of hide and seek and more a game of making one juke and trying to sprint to the finish. As a result, getting caught at least once on each half is more or less inevitable. The Nazgul players have a couple of abilities to help on their search. The most important of which is called perception. When they use this ability they ask the ring-bearer player if they are currently in the same zone of the map they are in. The early game is all about rushing over to the slice of the map the ring-bearer needs to be in given their current amount of movement and perceiving as much as possible until you hone in exactly where they are. Then it’s a matter of surrounding them and hunting them down in their particular location. It’s terribly hard for the ring-bearer to escape once they’ve been cornered because it usually takes multiple turns to move to a new location. See, over half the map locations aren’t location at all, but unnumbered wilderness pips. As the ring-bearer player marks down their movement each turn, they have to choose either a number or a pip. Most locations have at least one pip between them and connected locations, and the ring-bearer’s “current” location is their last numbered entry on their movement list. So in reality they stay in one location for multiple turns before jumping to the next one. In a hidden movement game, being caught should feel like a noose being slowly tightened around your neck, not just an inevitable result of getting to a certain point in the flow of the game. Once caught, each Nazgul within an adjacent spot pulls a single corruption tile from a bag (just like War of the Ring), and then the ring-bearer escapes to a connected, numbered, location. Of course, there are usually only 2-3 possible locations they could go to since backtracking would leave them without enough movement to actually complete the route. So finding Frodo again is going to happen eventually, it’s just a matter of when the Nazgul happen to choose his route to search and how close he is to the end. That’s not to say that there aren’t interesting aspects to the game. It looks great, for starters, with beautiful art and illustrations that tie it in visually with War of the Ring. Everything in the game is sourced from the books and Lord of the Rings enthusiasts will be delighted to see minor characters and obscure locations pop up. Each side will accumulate action cards of sorts, and while the Nazgul cards aren’t anything to write home about, there are two types of cards for the ring-bearer that legitimately make the game more interesting. The first are ally cards, which put tokens on the map that block Nazgul movement. 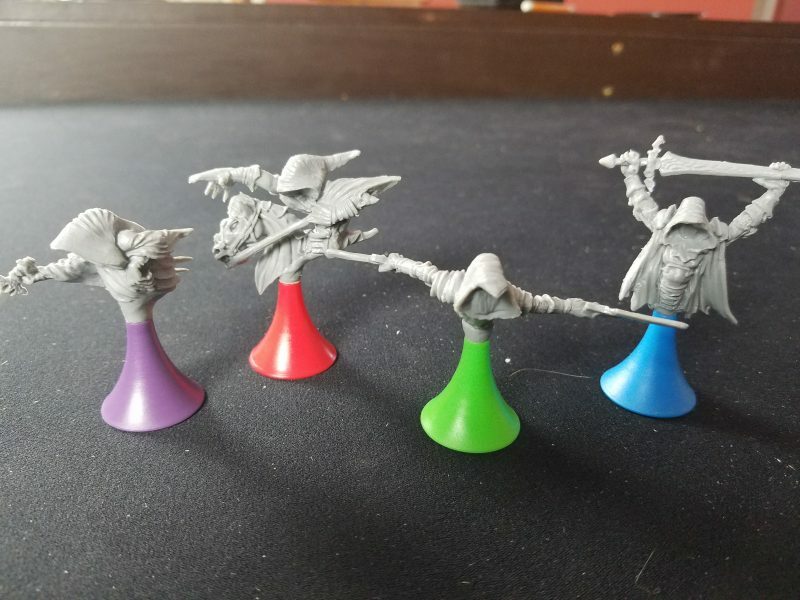 The Nazgul can kill these helpers, though it costs a precious “hunt” die (again borrowing from War, action choices for the Nazgul are determined by dice rolls) to do so. Ally placement is determined by the random card draw itself, but they can occasionally provide a roadblock at a critical time, helping Frodo evade capture for a turn or two. The second kind of card lets the ring-bearer player block certain types of actions that the Nazgul try to do. While I might not like this kind of “take that’ mechanism in most games, it works here because the motive for playing the card is obscured. Are they cancelling your perception because it would have resulted in a positive tag, or because they’re trying to bluff and throw you off? The Nazgul can be aided by a decently executed mechanism where they hunt down randomized important locations to gain special powers for their dice. Four of the named locations are hidden behind the ring-bearer screen at the beginning of the game, and if a Nazgul searches one of those location, they unlock the next special power. These powers essentially provide more flexible options for using dice instead of anything outside of the normal powers available, but the mechanism adds a decent subplot to the proceedings. Once Frodo reaches Bree, you flip the board over and start part 2. Here, the ring-bearer player mostly controls Gandalf, who is trying to distract the Nazgul. 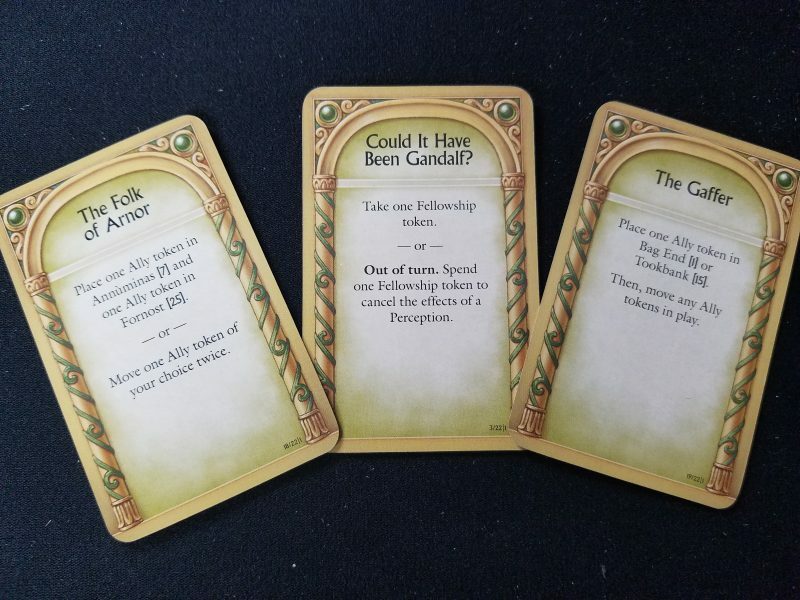 Frodo’s path is determined by a pre-selected card. Other than choosing between two cards at the beginning, the player has absolutely no say over where Frodo goes, and I have no clue why. I don’t understand why, as a designer, you would so deliberately take away agency from a player in such a significant way. As Gandalf, you have three primary abilities to aid Frodo. There are three randomly chosen locations you can visit that increase the corruption threshold for losing the game. You create false positives on perception checks, which, if done correctly, can send the Nazgul off on wild goose chases. And you can directly confront Nazgul, driving them from their location and blocking a path for a turn, giving Frodo some time to move forward. Ultimately that isn’t enough to make the second half of the game interesting. Largely it’s more of the same with the occasional perception-fake and no ability to control your path. Isn’t that the entire point of a hidden movement game? Furthermore, this railroading mechanism creates odd non-thematic moments where, if Frodo is caught, he reappears on a randomly chosen path from the deck. Instead of escaping and trying to scurry away, he teleports to another spot, and the search begins entirely anew. Because the path in both halves must be from the left to the right side of the map, and because there’s so little flexibility for trickery, Hunt for the Ring is ultimately a lighter hidden movement experience. 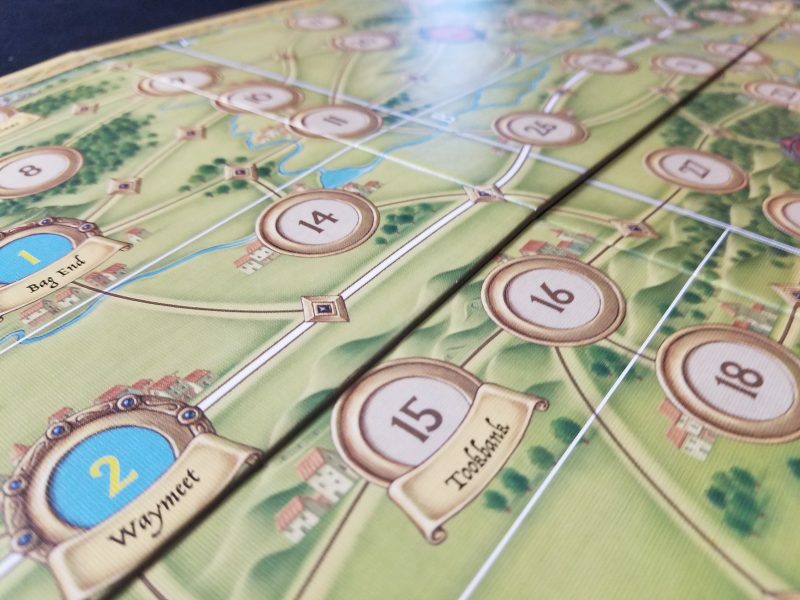 Even though the rulebook is overly verbose and there are a number of added bits and pieces to make the game seem deeper, it’s a fairly light game at its core. There’s some simple deduction and a bit of suspense, but most decisions aren’t particularly difficult. With the Lord of the Rings theme and beautiful presentation, this would make a pleasant 45 minute game where there’s a greater chance of a meta developing to make the hidden movement parts more interesting. Unfortunately, with the full 5 players it can drag on to up to three hours. There’s simply not enough game here to justify that. It’s an absolute slog. The ideal situation is a two player game that can be completed in just over an hour. With that kind of pace the game is decently fun, but I don’t think I’d ever play a non-2-player game ever again. More than anything, Hunt for the Ring made me want to quit and play War of the Ring. It borrows so many mechanisms and details from the latter game but universally makes them worse. Instead of a thoroughly thematic alternate history of Tolkien’s epic, Hunt for the Ring is a mediocre diversion. Sad to read it didn’t work out for you! On the other hand, thanks for writing this and potentially saving me from a disappointment. I’m a big War of the Ring fan, too, so I was naturally inclined to give this one a shot. After reading this, I’m rather relieved that I didn’t. Just as you said, hidden movement games are tricky to get right, and it’s a pity this one apparently failed to do so on multiple accounts. Thanks for the review! You’re welcome! A podcast with further thoughts should be up later tonight. I think designing this genre of game has some very difficult inherent challenges. Just finished our first game today, actually. I’m not sure our experience matched yours as I found the second half especially interesting and quite tense. The lack of control over Frodo’s movements meant you had to spent more time psyching out the Nazgul. It’s the first part that seemed overtly familiar, but also reasonably short. That said, we found out afterwards that we did get a few rules quite wrong, so our next game may play our differently. But so far, the game seems a decent entry into the hidden movement genre, albeit not quite as clean and accessible as its bigger brother Letters from Whitechapel. But ultimately, I didn’t find the Gandalf play interesting enough for it to work, and I’m not sure that it would get more interesting with more plays… If the map allowed for more freedom in Frodo’s movement, then I think Gandalf throwing the Nazgul off the scent would be a lot more satisfying. The 2nd half also does something interesting in that it inverts the power dynamics at the table. Usually in a hidden movement game the hidden player is in a position of power. They drive the game’s momentum and through obscuring their position and plans, put the chasing player(s) in a weaker and more defensive position. Hunt for the Ring’s 2nd half subverts that dynamic by taking that power away from the player. Now the hidden player still needs to obscure and confuse their opponent(s), but without the control you’re used to. I think that’s an interesting departure for a hidden movement game. It’s why I’m keen on playing the 2nd part again soon. Just to see to what end this new player dynamic opens up different ways of play. An interesting review. I had to do a double take (kind of) when I read that a 5 player game can take 3 hours. I’m surprised that a 2 player can take an hour, I got the distinct impression this would be a 45 minute max game. It is a shame you didn’t like it, clearly as a fan of Tolkien and War of the Ring it but you points seem very valid and well balanced. Yeah given how light it is it really should be shorter. 45 minutes per side is doable if you go quickly, but I don’t think you could get much quicker than that.